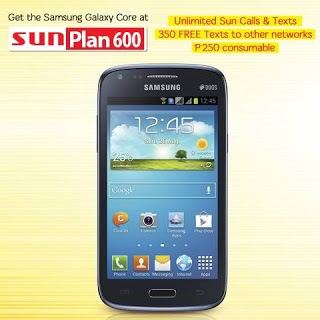 Sun Cellular is now offering Samsung Galaxy Core under postpaid Plan 600 that comes with call and text profile plus consumables. If you're looking for Galaxy S3 Mini alternative this phone is a good choice for you, it has almost the same specs with that phone and a larger screen size. If you're interested to apply with this plan, go submit your requirements at your nearest Sun Shop to be able to avail this Android phone. To those who are asking what the needed requirements are and how to apply Samsung Galaxy Core Plan 600 with Sun Cellular see post below. Galaxy Core is an Android smartphone, running on latest Jellybean OS with 4.3 inches screen size. Powered with a dual core processor paired with 1GB RAM which is enough to handle multitasking jobs when using the phone. It is also capable to connect open Wi-Fi hotspot and support mobile network connectivity like 3G/HSDPA and HSUPA. For camera, it has 5 megapixels on the rear side and a secondary back up VGA camera on the front. Based on Samsung release, this phone comes with a dual SIM, still to be confirm if we can use the other SIM slot with other network. What else can you get with Sun Plan 600? If you guys want another options of phone which is also in Sun Plan 600, we can give you a options for you to check out if it fits your lifestyle. Check: Nokia Lumia 520 free at Sun Plan 600. To those who want to get this phone with Globe Postpaid Plan check Samsung Galaxy Core Duos Plan.